First i want to say i do this as a "Worker" not a "Boss" i do NOT want control over this project.. I was number 1 song writer in liverpool for 2 months, i was number 1 composer in the world for 6 months (IE.. music and lyrics are right here) im also not a bad video editor, ive directed a few movies (im even credited on the internet movie database) what i LACK is transport and people to talk to, stories to tell... no tv station is covering this are they? everyone's avoiding it, but clearly google are pretty much impartial and the videos stand on youtube... So maybe video is the way? but that takes organization and stories that matter, visually shown with music that also sells its story..
ya no in a paranoid world you could say the Barriers that the council hire are hired from the brother of a guy who arranges marches and protests..... this needs to be done where their is NO WAY anyone can directly earn from it.. that way no one can stop it while its under investigation and all that crap they spin to stop ideas that would of worked.. UPDATED BELOW.. SEE 2nd Poster!!! 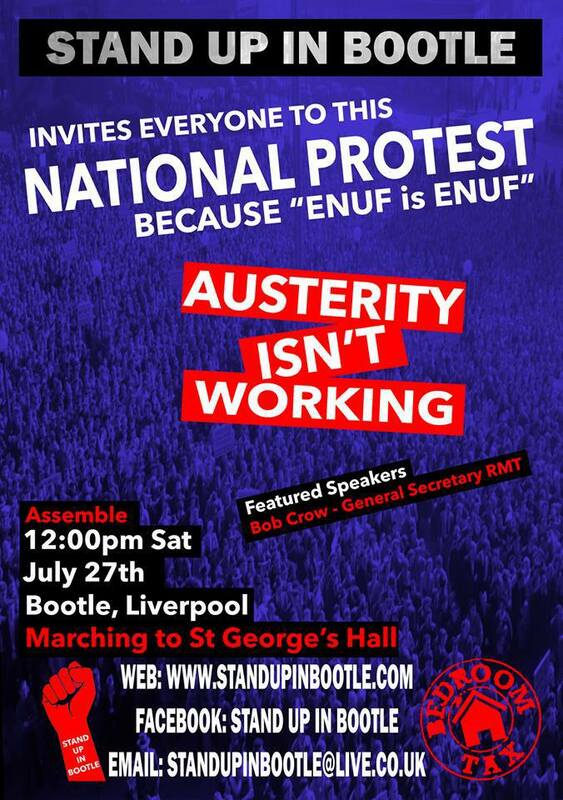 Since making this offer NO ONE has got back to me from "Stand Up In Bootle"
There are a lot of videos on youtube, but everyone seams to be ranting, chanting and generally kicking off.. its like the picture posted up with the noose "Support David Cameron" until theirs a crowd then let go. This is the image being portrayed. Yes we are angry, yes we are being royally fkd over. and are people acting like their gona burn him first chance they get.. Yet clearly no ones gona get the stones to steal a tank and go do this. 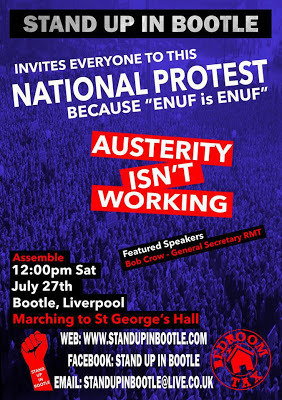 videos of people telling it "How It Is"
I pretty much guarantee these guest speakers are going to bring nothing to this event besides cheers of here here, and upping their reputation.. this should make change, not bring high hopes of nothingness..
its like the Rail Strikes, they fk over millions of people tryna get around the uk every xmas, they destroy lives every year.. and what do they get for it? And even if not.. You are not out of the race... Just uploading that DVD, taking that viral, defo more chance of having the public behind you than leaving them in the fkn cold over xmas tryna get from A to B with no trains.. There are ways of doing things & when rule of thumb doesn't work you change gear and you change it fast.. the public could put a bigger dent in the rail service than a strike does. Alienating people seldom works, but the majority are alienated by the government and their showing it big time.. but you know full well sometimes its better to just Cry and let it all out than to Argue, the question is what looks better? what really goes down better.. Honesty or Anger? Pain or Prejudice? All acting like some rival faction.. when were just every day people who are victims of corruption. I mean the pathetic thing is wtf are we doing ffs? Can you imagine filming just a mere 100 people? Just how many would actualy talk about "Them Selves" ? or even "Their neighbour" or someone they actually no who's in distress ? I think 2 out of 100.. what about you? Ya no ALL The rest... would all be "this fkn government" and "that fkn cameron"
Is that how petty and fkn argumentative we really have become? Read THIS and THIS and THIS we MUST STOP THIS STUPIDITY!!! !